Making cold brew coffee at home can be as simple as using a jar, coffee filter and coffee grounds. 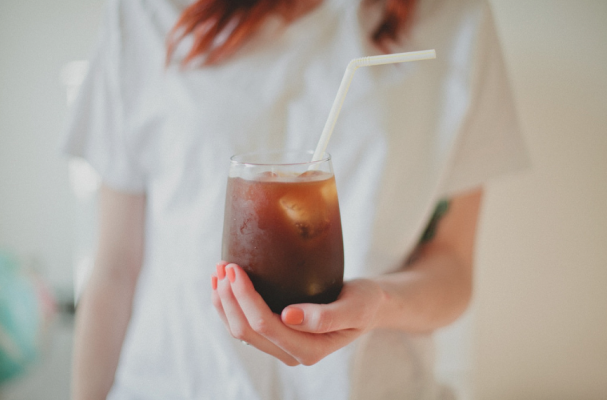 The cold brew process yields a milder, less acidic coffee that is ideal for summertime sipping. Instead of relying on heat, the coffee grounds are stepped in cold water for up to 24 hours. Once the coffee has been sitting for an extended period of time, it is filtered twice. You'll want to pass the coffee mixture through a fine mesh sieve and then through a coffee filter or fine cheese cloth a second time to remove any residual sediment. The typical cold brew ratio is 1 part coffee concentrate to 3 parts water. At this point you can flavor your cold brew coffee with a variety of sweeteners like maple syrup, vanilla syrup or sweetened condensed milk. Additional flavor boosters include cocoa powder, spirits (like bourbon), almond extract or even ice cream. This coffee is best served over ice and can be kept in the fridge for up to two weeks.